No wonder Nick Parker (Henry Thomas), the central character of Alex Winter’s film, Fever, suffers the full panoply of New York alienation disorder &#150; faces constantly close up in eerie light will induce paranoia in just about anyone. But is his predicament bad luck or an inevitable destiny? 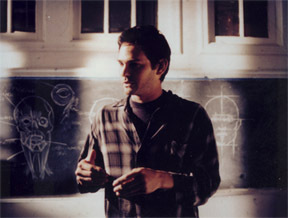 It is no accident that Nick is an artist &#150; the film seems to be a study, a nocturne (as James MacNeill Whistler called his crepuscular fog-scapes), on the moods induced by certain tones and overtones of light, and the menace underlying certain manners of conversation when filmed in such light. Hallucinations from a 105-degree fever are hardly necessary in a mise-en-scene like the one Winter has carefully devised for Nick. The faces in Fever are all just a little too close, many are in just a little too much shadow. The light tends to blue or charcoal gray, suiting dimly lit, creatively rundown apartments in Greenpoint across the East River from Manhattan, whose impassive skyline, shot against pastel clouds at various times of day, seems to represent a society and a deity alike impervious to our protagonist and his dilemmas. When white froth or red blood shows up, very slightly, very deftly, against this gray-blue background, it stirs a deeper unease than it might filling the screen in a slasher epic. Nick is not merely an unsuccessful artist, a soon-to-be-fired art teacher, and a sleepwalker who, as a child, saw his mother overdose on heroin; he may also be a murderer. We join him as he arrives, one dank evening, at his depressing digs, only to find them invaded by the gruff Polish landlord who lives on the ground floor (and who brings along his straggle-haired mother when searching for leaking refrigerators). Adding to Nick&#146;s oppressions in a way New Yorkers will easily understand, the landlord has broken a promise not to rent the wretched flat upstairs, giving it for a few days between voyages to a sailor with a Gaelic accent (David O&#146;Hara), a man who dwells in shadows and reads books on Nazis and Gnostics, whose shadowy world-view colors his ominous conversation. Then there&#146;s the drawing class Nick teaches, the one the school plans to drop next semester. Then there&#146;s the class model trying to lure him into her bed. Then there&#146;s Nick&#146;s successful sister, amiable father, helpless stepmother, trying to get some kind of human rise out of him. It&#146;s just one damn thing after another, and the very walls seem to be closing in on an increasingly desperate Nick. The most human contact he seems to have is with the solemn mahogany head of the cop (Bill Duke) investigating the hideous murder of the landlord. Did Nick witness this event and forget it? Did he do it in his fever? Did he do it while walking in his sleep? Did he, as a child, slash his own sleeping father in a similar fit? Did he also throw the only witness off the roof and then forget it? Is the Nazi Gnostic upstairs implicated, or is he a witness? These questions serve as excuses for skillful mood painting with the palette of a filmmaker: uneasy light, crowded camera shots from dizzying angles, faces too close and eyes too intense for comfort, hallucinations and haze. The viewer is trapped in the febrile sensuous impressions of Nick&#146;s brain, feeling as claustrophobic as he feels from the too-bright, too-false interactions of normal conversation with normal people lit too brightly, as confused as he is by the clutter of images and shadows, by memories that may not be true. We are jolted not so much by the predictable dream sequence, the flames behind the ceiling, the old woman&#146;s ogrish leer, as by the strategy Nick takes to prevent disaster: tying himself spread-eagled to his bed, so that he will not be able to walk in his sleep. Seeing this makes us feel as trapped, as defenseless, as hostile, as ill as Nick does. The best thing about Henry Thomas&#146;s performance as Nick is that he does not lift a finger to win our sympathy. He&#146;s as exasperating as a friend in too much trouble to ask for help, and far too self-willed to accept it. We never quite abandon him, weird and even threatening as he becomes &#150; because Mr. Thomas never loses a basic appearance of decency, even as he rejects our sympathy. This makes his disaster all the more pitiable. The other actors are also understated and human, which is a tribute to the direction (and the casting). Mr. Winter, aided by Joe DeSalvo&#146;s photography, Mark Ricker&#146;s production design, Thom Zimmy&#146;s editing, and &#147;visual effects&#148; by Thomas Rainone, has produced a serious, uneasily attractive and hauntingly artistic vision of a mind falling apart. More: he has put us inside that mind, to show the world caving in upon it.